Notes: Provost Officer. He was born and resided in Gloucestershire and formerly served in the Tank Corps. 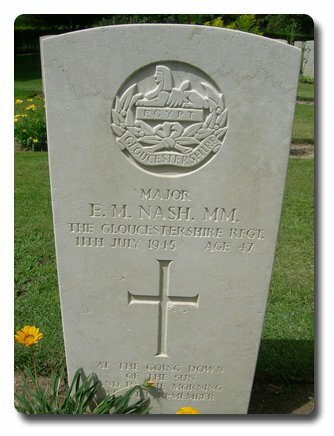 He was commissioned in The Gloucestershire Regiment, 2/Lt. 18/7/40, London Gazette 34931, page 5208, dated 27/8/40. 26/5/45 became OC B Dog Coy, CMP, Italy. No mention of his death in War Diary WO 170/7032 B Dog Coy, Jan - Dec 1945. Inscription on gravestone: At the going down of the sun and in the morning we will remember. Citation: Tank Corps, Awarded for action in North Russia in 1918.